Story Summary: Surreal is the only way to really describe TALE OF SAND, which is a graphic novel based on a “lost” screenplay by Jim Henson, of Muppet fame, and his writing partner, Jerry Hujl. The screenplay was found collecting dust in the Henson archives and was given over to the very talented graphic novelist Ramon K. Perez, whose vivid illustrations tell the tale of a stranger known only as “Mac” set in motion on an adventure in the American southwest. I can’t even begin to do the story tangents justice here, except to say that the narrative shifts from scene to scene, from danger to danger, just like particles of sand blowing in the wind of chance and imagination. (Think Rod Serling and the Twilight Zone, and you will be in the right ballpark.) There are hints of old Westerns, and rampaging football players, Arabs in the desert, the continuing image of an unused cigarette, bombs and guns, and elaborate champagne dinners, and so many oddball twists that it seems clear to me that only a graphic novel could capture that kind of energy of story. (And it is even clearer why Hollywood kept turning down the screenplay.) In fact, once you buy into the surreal nature of the story, TALE OF SAND becomes magical, unpredictable and thoroughly enjoyable. Art Review: Perez is a master of surreal imagery, and the oversized nature of TALE OF SAND provides him with a large canvas from which to work. There are overlapping images, colorful splashes contrasted with pencil sketches, multiple storylines unfolding in adjacent frames, and yet through all that craziness, Perez keeps the reader completely focused on the travails of Mac, with his square jaw that echoes of Clark Kent and eyes betraying confusion over his predicament of being caught up in something outside of his control. Perez immerses the reader in the story with the visuals, and if you stay with it, the artwork becomes the main narrative device. (I particularly loved how the savage football players talked in x’s and o’s, like a football play handbook). In the Classroom: This book might have value for upper high school students, or university students, around the ways that surrealism can be used in narrative writing, and how art connects to story. Also, for those with an interest in Jim Henson, the introduction and ending of TALE OF SAND provides inside information about Henson’s work and the development of this story. Those small pieces of writing gives the book some historical weight, particularly now with the pop cultural resurgence of The Muppets. My Review: I was fascinated by TALE OF SAND and completely dove into the surrealistic nature of the story. I RECOMMEND this book for upper level HIGH SCHOOL students, but teachers should know there is one scene that shows the naked chest of a woman near the end of the story. I don’t think middle school readers would follow the narrative with any interest, given its surreal format. I wrote this poem a few years ago as a mentor text for my students, and then my math colleague and I podcasted it out. 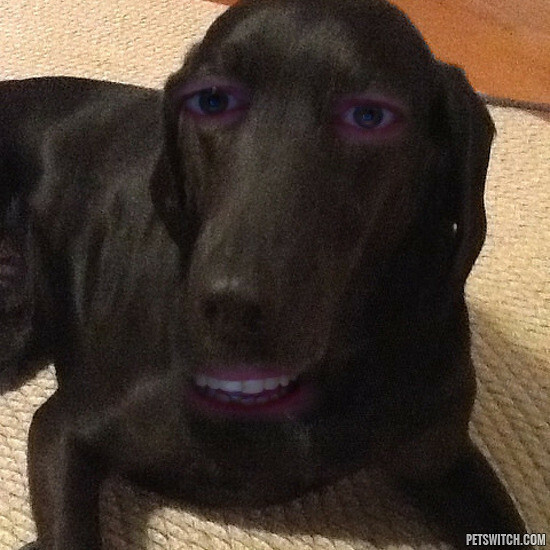 Unfortunately, we used Cinch, which has since gone kaput. So, I have this version of the poem and will need to wrangle my colleague to record a new version. Once again, my friend Chad Sansing has created a cool remixable project via Webmaker that I just had to check out and remix myself. Chad made a ‘zine template with Thimble, which you can adapt for your own area of interest, print out, fold up and hand out to friends. 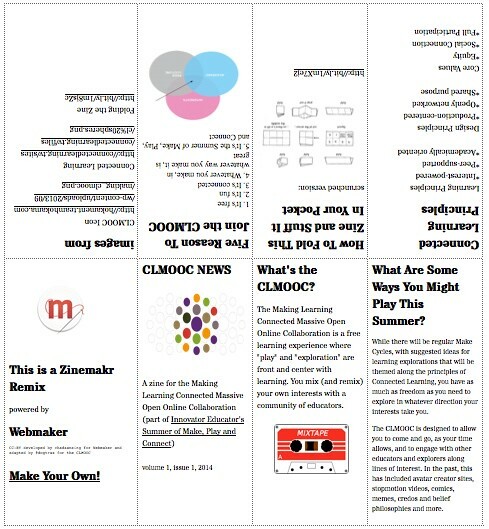 I went in and made a little zine for the Making Learning Connected MOOC, which launches into its second iteration this coming summer (Come sign up and join the fun!). If you hit the remix button on either Chad’s or my #CLMOOC zine project, there are all sorts of helper notes in the code that Chad has written than will walk you through the process of coding the page. After making the #CLMOOC zine, I printed it out (this took a few trial and errors to get the setting right on the page — I went landscape, at 60 percent, with my Firefox browser), and folded it up, and then shot this short Vine piece of the zine. Story Summary: With all of our focus on graphic novels, it is easy to lose track of the power of the daily comic strip. The connections between art and words and character coupled with the confines of just a few panels is something magical when done right (and painful when done wrong). 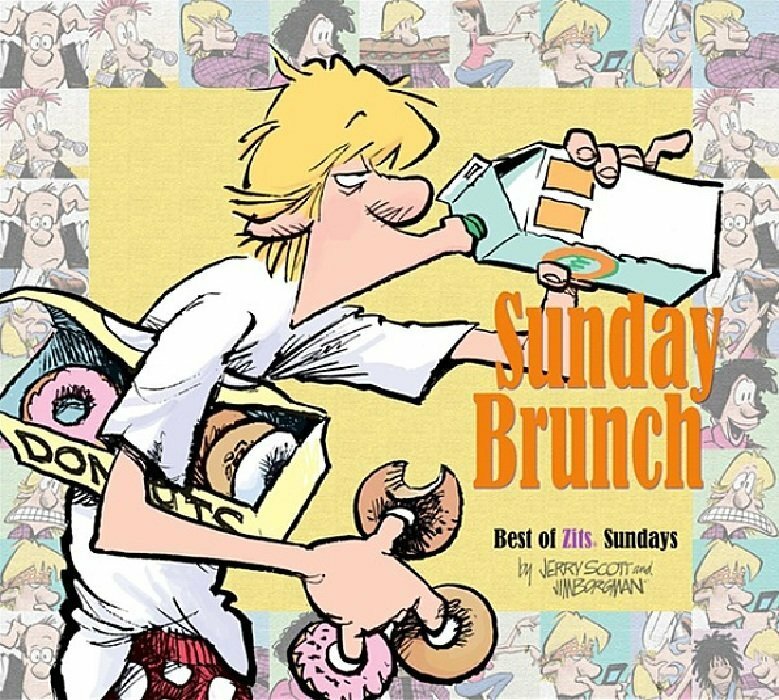 SUNDAY BRUNCH: THE BEST OF ZITS SUNDAYS by the partnership of Jerry Scott and Jim Borgman is a massive collection of comic strips featuring a the growing teenager, Jeremy, and his two befuddled parents, Walt and Connie, as they weave their ways around life. The comics have perfect pitch (at least, to me, as a parent of a teenager) but what sets this collection apart from some others are the guest narratives of other comic strip writers and artists as they talk about their own inspirations. These short narratives are interspersed throughout the book by comic strip colleagues, and the personal writing provide a wonderful lens into how comics played a part in nurturing writers and illustrators. It’s interesting to see how subversive comic strips were for so many of them – tales of flashlights under covers abound. Add to that the little annotated notes that Scott and Borgman put beneath most of these comics to explain where the ideas for the jokes and art came from, and you have an insider’s view into the world of newspaper comic creations. And you can laugh while you learn. Art Review: What sets the comic strip Zits apart from most of its brethren is the art, and I was really fascinated by the explanations for some of the experiments that Borgman (the primary illustrator, although the book gives some nice insights into the partnership between the two collaborators) provides as he works all sorts of echoes of modern art into a comic strip. There’s also some nice commentary on the impact of the shrinking comics sections on artists, and what that has meant to how an illustration perceives their canvas. In the Classroom: I have lots of comic collections in my classroom. Calvin & Hobbes remains a hit. When we talk about having variety of reading materials, we should consider comic collections as another way to draw kids (particularly, boys) into reading. SUNDAY BRUNCH: THE BEST OF ZITS SUNDAYS is a great collection that would fit nicely in the bookshelves of a middle or high school classroom. From a teaching perspective, the narratives around the impact of comics on writers and readers might open up doors of discussion around the kinds of reading and writing that your students do outside of school. What are they reading that we never see? It’s worth finding out. My Recommendation: I highly recommend SUNDAY BRUNCH: THE BEST OF ZITS SUNDAYS for middle and high school classrooms, and for the teacher with teenagers in their lives – either sitting there in that desk or lounging around at home. 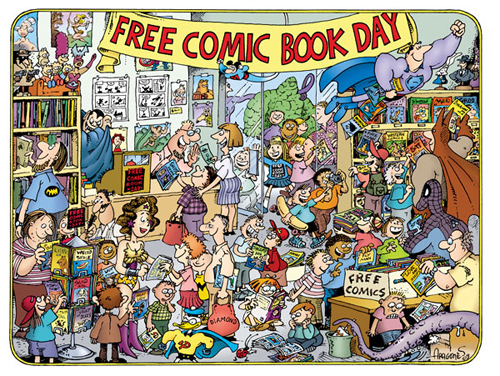 Hey — Today is Free Comic Book Day! (And tomorrow is Star Wars Day — May the Fourth be with you). Find a store near you that is giving away free comics and get a few, if not for yourself then for your kids or your students. The Free Comic Book Day website has more information, including a handy “store locator” tool. I don’t know of a better format for class podcasting than the haiku poem. It’s a theme that is short, focused and allows for easy sharing of words as a group. We continue to work on poetry, even after April ends, and yesterday, some students shared their poems as podcasts as National Poetry Month came to an end. We used our class Soundcloud account to share out. 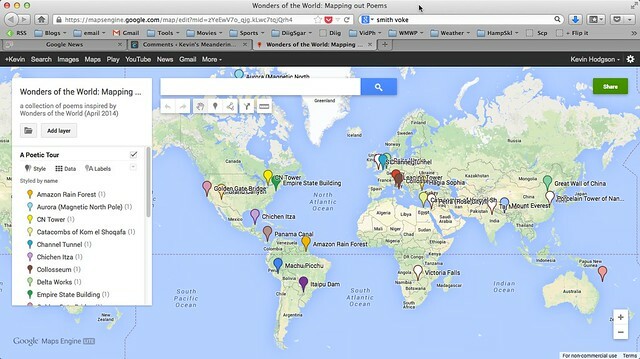 April is over, and so is our daily poetry writing about Wonders of the World. One of tasks I started to give myself midway through April was to create a map, where I began linking my poems to the geographic locations that inspired the poems (with topics provided daily by Mary Lee at A Year of Reading — thank you, Mary Lee!). A few of the topics at the end — like chocolate — are not located on the map because I didn’t have coordinates for yumminess. Maybe I should! And yesterday’s sound poem, about the wonder of people, didn’t make it, either, so I decided to make a sort of digital story with the audio. This is yesterday’s poem, with audio brought into Zeega as way to layer in some images.